When I last wrote about our road trip back in December, we had just left London after a blissful weekend. Next stop: a quick detour through Belgium on our way to Paris. We rolled into Bruges around 8 o'clock at night last September, having taken a ferry from Dover, UK to Calais, France and driven to Belgium. Let me set the scene with a disclaimer: our experience of Bruges by night was thus coloured by hanger (anger resulting from hunger), bad weather, and sleep deprivation. After inspecting the menu of every single restaurant in the city's main square, and being turned away by many ("the kitchen is closed! "), we threw up our hands in frustration (I don't eat much meat, neither of us like mussels, and we were on a budget - no €40 plates for us) and ate at Friterie 1900. Not the best meal of our trip (one Trip Advisor reviewer suggests you "eat your arm over eating here") and still not cheap - €25 for various fried things and drinks. Our meal's saving grace - the Grote Markt's bell tower played an hour long concert that evening. It was magical, and almost made up for the soggy fries. The moral of the story - do your research and eat dinner early in Bruges. Or, better yet, park yourself at Cafe Rose Rouges. 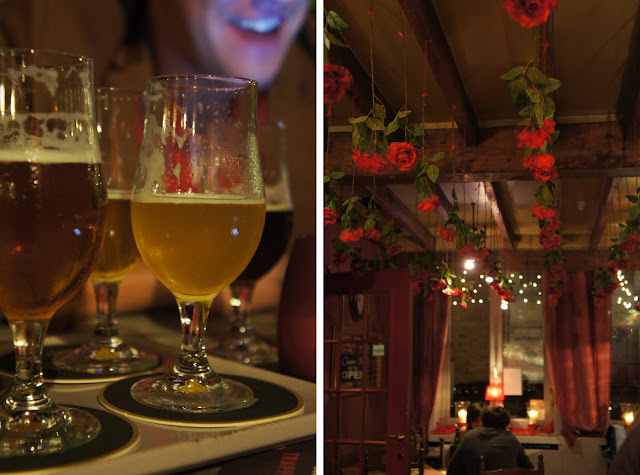 We didn't realize when we checked into the adorable Hotel Cordoeanier that its Cafe Rose Rouges doubles as a bar/restaurant (open til' midnight), and is one of the most highly recommended in Bruges. No surprise there - they serve over 150 Belgian beers the proper way (each at a very specific temperature - all of them really, really good) at great prices (4 for €9!) in a charming little nook of a restaurant and on a fun, vintage-vibe terrace. Add fantastic staff and awesome music (Edith Pilaf and Christmas carols!) and our lacklustre evening in Bruges was quickly resurrected. If only beer (and chocolate) cured the common cold, which took us out, one after another, during the days to follow. Up next: Bruges by day! And the strangest place we saw a bicycle in this little Belgian city. I love the term you've coined - hanger. I suffer from that regularly when traveling! Hanger is by far the worst travel companion! haha!